which runs Friday, June 29th through Tuesday, July 4th. Our home furnishings store is located at 530 Basalt Avenue in Basalt, Colorado and is open Monday–Friday 10:00am–6:00pm and Saturday 10:00am–5:00pm. Note that we will be closed Sunday, July 1st and Wednesday, July 4th. Cathers Home is delighted to be a part of Mountain Living’s On-Line publication this month. Read This Downtown Aspen Penthouse is Pure Luxury and explore a recently completed design project in one of only a handful of Hotel Jerome Residences at the Mill. And the 2018 Color of the Year goes beyond trends. According to Laurie Pressman, Vice President of the Pantone Color Institute, the Pantone Color of the Year is “a reflection of what’s needed in our world today”. That’s an excellent reason for selecting a color. Ultra Violet is a bold color, making it ideal for drawing attention to a chair, sofa, lamp, rug, or throw pillow. Cathers Home has used Ultra Violet in the past, including in our Snowmass Ranch project. And we also harnessed this imaginative color in our Colorful Mountain Retreat project. Here are some Ultra Violet pieces chosen by Cathers Home. We’re excited to see how the interior design industry uses Ultra Violet in 2018! Happy Holidays! Cathers Home is delighted to announce our Semi-Annual Customer Appreciation Sale which runs December 26–30, 2017. High Point Market is a must-see event in home furnishings that is held each Spring and Fall in North Carolina. It is the largest furnishings industry trade show in the world and we love attending. Explore latest trends from the recent show. Everyone had a fresh take on this year's newest chair styles. From leather strap details to wood frames. Pattern fabrics and faux furs alike. What is your favorite? 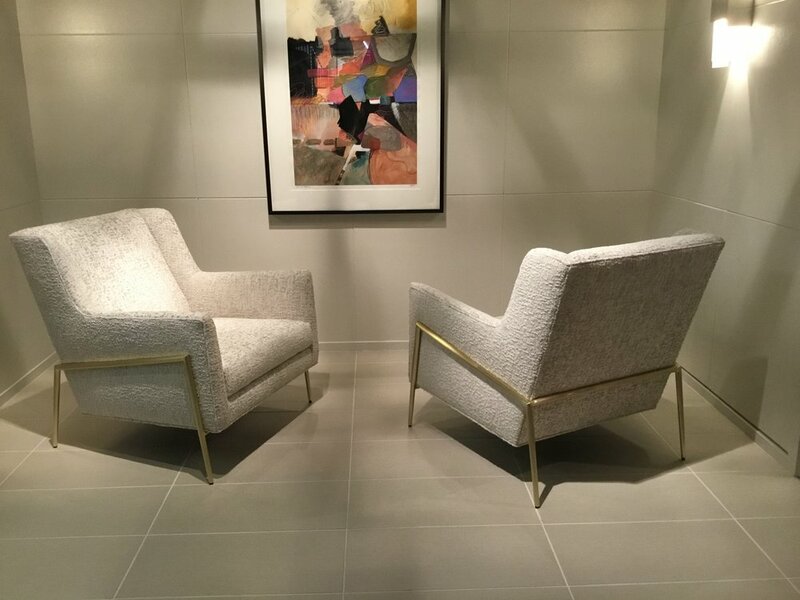 Softer contemporary that is inching its way back with a little bling. Immerse yourself in colors and ideas, from the classic to the cutting edge, the quiet and calm to the stunningly bold, drawn from a full spectrum of cultures and transitions. Explore the more colorful inspirations we found at the Highpoint Market. Each year, top interior designers, architects and furniture devotees converge on High Point, NC for the High Point Market, the largest home furnishings trade show in the world. Here we highlight a few significant and impressive trends from the recent show that we expect to see more of in the coming year. Interested in any of the new and unique interior design trends? Contact Cathers Home. Cathers Home is happy to announce our upcoming customer appreciation sale. We are grateful to all our customers, here in the Roaring Fork Valley and beyond for their dedicated and loyal support over the years. Our customer appreciation sale will also feature a special rug clearance area with select premium rugs up to 75% off! Be sure to check out our new rug wall display which allows customers and designers to easily view and shop for rugs. We are located at 530 Basalt Ave Basalt CO and are open Monday-Friday 10:00am-6:00pm, Saturday 10:00am-5:00pm and Sunday 11:00am – 4:00pm. * Some manufacturer restrictions apply. The warm spring temperatures have us all itching to be outside on the deck or patio enjoying friends and family. Our latest shipment of patio furniture has just arrived and what a perfect day for it. Come check it out. We have a wide variety of teak, faux wicker and stainless with Batyline. Get yours while it lasts! Paul and the Cathers team invite you to come see our new rug wall display! Pictured above, our rug wall display allows customers and designers to view and shop for rugs in an easy and efficient way. This newly designed space also provides a unique display space to our already beautiful retail store in Basalt, Colorado. To make the shopping and designing process even easier we have invested in an array of 2x3 and 3x5 rug samples for clients to take with them to see how the rug samples work in their space. Once you’ve found the right rug we will order it in the size that you need. We hope by including these samples in the shopping experience Cather’s Home can continue to provide and expand upon our award-winning services. Paul and Jack, our rug experts, are always happy to help with selecting the perfect rug and are available for a complimentary in home consultation. So please reach out to schedule a consultation or with any questions you might have and we will be happy to help in any way we can. Cathers Home has consistently proven to our clients that we provide exceptional services. It is exciting to once again have our exceptional design work and service be recognized publicly. Houzz, the leading online platform for home remodeling and design awarded Cathers Home 2017 Best of Houzz in design for the fourth year in a row and 2017 Best of Houzz in service for the second year in a row. These homes were designed by Denise Taylor, M.A. Allied ASID, Design Director, Amanda Furlong, ASID, NCIDQ, Interior Designer. Cathers Home looks forward to continuing to provide award winning services to our clients as we move into another exciting year. Like a nutrient-packed elixir, 2017’s NOURISHMENT theme rejuvenates both the mind and body. Focusing on deep sea blues, lustrous greens and grounded purples highlighted by matte metals and stone, NOURISHMENT creates spaces that are reminiscent of the deep ocean or the cool shade of a dense forest. Giving form to the concept that to be nourished, in both body and mind, is true luxury. Top designers throughout the United States envision NOURISHMENT as one of the top trends throughout 2017 with applications from interior design to architecture. This cutting edge and experimental approach to luxury gives Cather’s Home Interior Design yet another concept to inform and inspire our timeless, classic and distinctive work. Every year the Pantone Color Institute releases the “Color of the Year.” This year the influential award has gone to Greenery or Pantone 15-0343. The color was picked after Pantone spent a year studying global cultural and social trends. In 2016 Greenery was offered on car models, showed up in street art and on fashion runways and in the global environmental movement. In retrospect, the choice makes sense. The executive director of the Pantone Color Institute, Leatrice Eiseman says “Greenery symbolizes the reconnection we seek with nature, one another and a larger purpose.” Pantone goes on to describe the color as “nature’s neutral” and revitalizing, rejuvenating and refreshing. We couldn’t agree more. Cather’s Home is based in the Roaring Fork Valley and has always felt the revitalizing nature of the fresh spring greens that spread over Prince Creek, Mt. Sopris and the whole Aspen Snowmass valley. With Pantone naming Greenery the color of the year we expect to see a continuation and expansion of current color trends, including an increase of the color’s use throughout modern interior design. Obviously, a strong green doesn’t need to be the focus of every home and like always, Cather’s Home will maintain its devotion to the time-tested design principles that have made us a fixture in the Aspen Snowmass area. Though, as spring rolls around in 2017, we’ll be taking a close look at the fresh spring buds and let the rejuvenating nature of greenery and spring in the Roaring Fork Valley revitalize our ideas and our work. 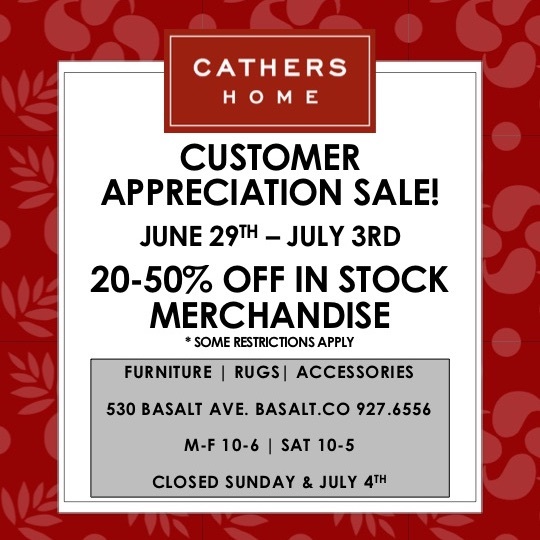 Cathers Home is excited to announce our upcoming customer appreciation sale. We know we couldn’t continue to provide our high-quality services without our devoted customers here in the Roaring Fork Valley and spread throughout the country. To show our appreciation, on December 19-24, we are offering 30% off in stock furniture and accessories and 20% off all in stock patio furniture. * Our store, located at 530 Basalt Ave Basalt, CO is open Monday-Friday 10:00am-6:00pm and Saturday 10:00am-5:00pm and has 3,000 square feet of stocked showroom to explore. The Cathers Home Team wishes all of our families, friends, associates and clients a very Happy Thanksgiving. We are extremely thankful to everyone that makes it possible for us to do what we love to do - help people create amazing homes and spaces where they can be happy and spend time with family and friends. Thank You!! Cathers Home will be closed on Thursday in observance of the holiday. Have a wonderful day! Diane Curtindale and Sue Omang recently went to the High Point Market, a must-attend event in home furnishings. We share a few images captured from the show which feature coming trends. Stay tuned on the Cathers Home blog for coming trends. Cathers Home is proud to introduce Cathers Tents. As an award-winning Aspen interior design firm, we chose to extend our expertise into events―specifically, temporary event venues. The goal behind our new venture is to make your event tenting experience one in a million. Cathers Home founder, Paul Cathers, designed these unique tents. To create a light and airy ambience, Paul included flowing, natural fabrics throughout the interior. Fabric covered hardware, poles, and metal surfaces, along with hand-carved teak supports and finials add an elegant finish. After years of attending events in run-of-the-mill tents, Paul Cathers and the Cathers Home team saw an opportunity to transform and greatly improve the event tenting experience. Cathers Tents are unparalleled in the tent rental industry, and will make your tenting experience as memorable as the event itself! We offer two 50'x50' tents, which may be used separately or together to create a larger space of 100'x50'. We also offer a 115'x85' tent with one center peak; this tent can accommodate up to 400 guests plus a dance floor. Tables, bar stools, handwoven rugs, sofas, coffee tables, and ottomans are available, as well as other custom furniture given ample lead time. Make Cathers Tents a part of your wedding, birthday, anniversary celebration, or other special event. Please contact Cathers Tents, Premier Party Rental at (970) 963-8368, Dana Presutti at (917) 331-7182, or Paul Cathers at (970) 379-2646 for more information about renting our tents for your event. Cathers Home is honored to be featured as part of Aspen Art Wave. Catch the wave on Tuesday, July 26th, 2016 from 3-8pm at 40 Watersone Way in Woody Creek Colorado. Aspen Art Wave celebrates 14 acclaimed artists presented in a spectacular river front home by Kim Coates of Coldwell Bank Mason Morse and Structural Associates. The event supports the Buddy Program of the Aspen and Roaring Fork Valley. It is produced and curated by Deborah Daine. Please RSVP to liz@buddyprogram.org.